Hi everyone, hope you are all well :-). In today’s look I’m wearing a striped turtleneck and a fuzzy long jacket that I found on sale. 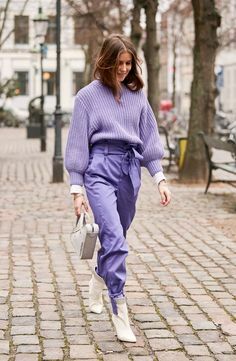 This combination gives it a bit of a 70s vibe, which I love! I’m totally into turtleneck tops this fall. I’ve paired it with my blue culottes, my favorite item from this summer. It’s a great item that doesn’t need to go to storage, I just wear it with platform boots to instantly upgrade it to fall favorite. Hi everyone! Can’t believe it’s already October….I’m really excited to work on some new songs and material this week, getting my home studio set up ready as we speak. It’s been way too long! I’ve been busy teaching, performing with projects and writing for others, so much I just couldn’t find the inspiration to write some new music for myself. Follow me on Snapchat (Commedescoco) and Periscope (@CommedesCoco_) to stay updated and get a little sneak peek! What are you guys up to this week? This outfit is perfect for those ‘not too warm, not too cold’ days. I’m wearing an old bomber jacket I rediscovered in my closet, comfy pants, and sneakers. I did a little hair experiment, and braided my hair in two long messy pigtails. With some help of my clip-in hairextentions of course, I wish my own hair this long! Really like how it turned out, what do you think of my braids? Yes, I’m finally back after a short hiatus last week. I’ve been having issues with my camera and laptop, very frustrating! Thankfully, it looks like everything is working again, so I’m starting with a new outfit post. I shot this outfit last sunday, after meeting a friend for coffee and strolling around a market in Tilburg. After those gloomy and rainy days, it was nice to see a little bit of sun. I wore one of my favorite bomber jackets, which is pink and instantly brightens up any outfit. This look is the last outfit I shot during my citytrip to Paris. I wore a striped maxi dress by Topshop, an item that became an instant summer favorite after I bought it. I’m kind of sad I’ll probably have to wait a whole year to be able to wear it again. I guess it’s officially time to say goodbye to summer and transition into fall. I don’t know about you, but I find it sometimes hard to choose what kind of things to wear.. Should I wear a jumper today, or is it still too warm? Do I need to wear tights or not? It’s so much easier to layer things in summer, because everything is so lightweight. As you can see, I layered my maxi dress with a sleeveless denim jacket and a white blazer. I guess I’ll have to clean out my closet soon and see what summer items need to be stored. Anyway, back to Paris! On this day we visited The Sacré-Cœur Basilica in Monmarte. It was a lovely day, we had crêpes with Nutella for lunch (best lunch ever) , and walked around the beautiful streets of Paris. Before dinner we visited a supermarket and bought some bread, wine and other snacks. We sat down near the Seine and watched the sun go down as we had a bit of a rest after so much walking around that day. Today’s outfit is probably something I won’t be wearing anytime soon again, since fall is knocking on our door. But I still wanted to share it, since it was shot on a sunny day on the beautiful Pont Des Arts bridge in Paris. A black highwaisted maxi skirt, printed top, a denim sleeveless jacket and sneakers. Hair in a bun and some cool aviator sunglasses, sometimes I just love to keep it simple. Curious? Here’s my first look from Paris! Wearing a co-ord set by Zara, in a beautiful navy color. This set is made of a great comfy and light material, so ideal for a long day of walking around Paris. It was such a great trip, it’s really fun to go through all the pictures I took while I was there. I was happy to shoot a few outfits there, since it’s such a beautiful city, even this little fountain in the middle of a shopping street was nice. A real fashionblogger would probably wear a pair of killerheels with this outfit..But I left mine at the hotel since my feet were sore and had some blisters, I just wore my Birkenstocks. Hi! I was browsing on Etsy a few weeks ago, when I found this burgundy “Yeezus” t-shirt. Am a big fan of Mr. West, and a Yeezus shirt was on my wishlist, so I ended up buying it, and was happy to find it in my mail box last weekend. I’m really great at late night shopping by the way. A glass of wine, some snacks and I’m happy as a clam. Wanna see more of my latest online shopping spree? Since I’ve been back from Vlieland, I’ve been revamping my boyfriend’s old Macbook. (So happy we kept it) Let’s just say, it’s been a little bit of a struggle. But it’s finally working, and it also stopped raining, so I managed to shoot an outfit again. I’m also planning to revamp my blog, trying to set up a new layout sometime this week. YAY! Today’s outfit features a long lost friend of mine, my River Island printed overalls, or catsuit, or whatever the hell you call it. It’s been hiding in the back of my closet, so glad I kept it! Curious?